Well, finally the mast is back on and so is the boom. We were a little delayed because the rack that holds the wind generators and two solar panels on the stearn wasn't made quite right and the end of the boom hit the the wind generators - so we ended up shortening it a little. 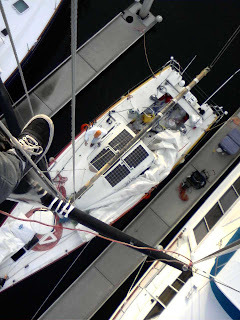 Luckily, the new main sail was a little short along the boom so we could cut about six inches off the back, clearing the solar panels and wind generators while still being a good length for the sail. While it was a small job it took awhile and set us back a day. We were hoping (though it wasn't too likely that we would be able to) to go out for a sail that day, but it didn't happen. 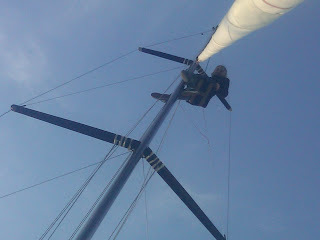 Yesterday the boom went on and today we finished up putting the sails on. We had all been hoping to get out for a little sail today, but by the time we were ready to go it was low tide and just looking in the water we could see the keel was completely covered in mud. Well, I'm slightly exhausted from all that's been happening and I've still got some packing to do, so I'll let you all know how things go tomorrow! PS There are some new photos on the web site photo gallery. 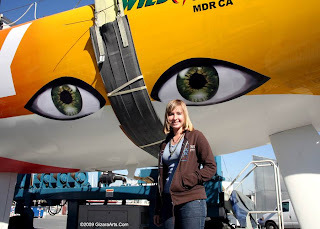 Also, the 'Boat' page should be updated tonight with lots more info on my equipment and photos of Wild Eyes' insides. It was nice to get to have Christmas at home. 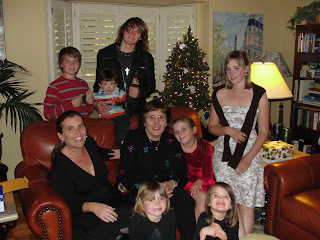 I had been looking forward to spending Christmas on the ocean... but in the end I was glad to be home. 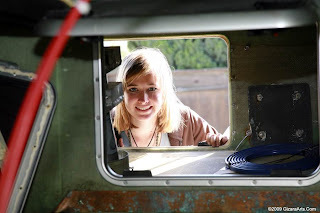 I've been reading Jesse Watson's blog when ever I get a chance, and I have to say I envy her a little at how far along she is and I can't wait to get out there myself and leave some of this craziness behind. Next project once the rig is tuned is to finish setting up all of my communication devices. We have been looking into a Thrane and Thrane Sailor 250 so that I'll be able to do Skype, send pictures, and upload video blogs! It was actually sponsored by them, though we still are a little worried about the airtime as uploading anything will cost quite a bit. Think of a cell phone bill times 10,000... but we have some good people on it so hopefully we'll get that all sorted out soon. I will also have the usual marine VHF radio and a high frequency SSB radio. We replaced Wild Eyes' old chart plotter/radar with a new Raymarine model. Vesper Marine has sponsored an AIS Watchmate 'ship radar' that has a seperate radar specificaly for picking up the signals of commercial shipping. It draws very little power so can be 'on watch' all of the time and tells you what type of ship it is, where it is headed and most importantly if you are on a collision course. I'll have two satellitle phones on board as well. Even with things getting more and more busy by the minute we are all able to keep our heads on straight and just deal with the things that need to be done. With my team of the best people out there and the support I have from family, friends and the community, every thing will work out fine. A few people have asked when I will do my sea trials. Since the old B & G autopilot is being replaced (by a Coursemaster system) I will do day sails to tune the rig, test electronics etc and head out for a few days on my own once the autopilots are installed. Hopefully by the end of the week. Lisa Gizara sent over a few photos last night as well. 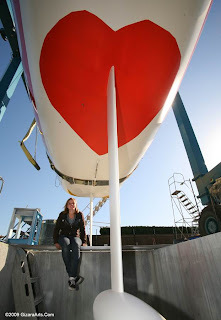 The heart , Abby and the 10' fin keel! Abby came home about 7:30, ate dinner, handed methe camera and was off to do some Christmas shopping with Laurence. Thankfully, a picture is worth a thousand words! New signs = thank you Shoe City! Toby was a great help today climbing in the bilge where no one else could fit to tighten a few things. There are a few new people on board working hard to help keep us on schedule. Jerry Nash has taken over where the electrician Mike (who flew back to north Carolina a few days ago) left off. While Mike is missed by us all, Jerry has done a great job taking his place. His son, Brady, has also been down to the boat most days to lend a hand. Also Allen Metzger has been doing an amazing job with putting in the water maker. The water maker installation turned out to be a bit trickier then we had thought it would be, and as there are so many people on the boat during the day, Allen has been getting to the boat late after most people have left and working until the early hours of the morning. Jerry, Brady, and Allen have all been putting in a tremendous effort and they are great to have on board. I don't know what we would do with out them! Today is a big day with Wild Eyes being put back in the water at 11:00, the mast being reinstalled at 11:30 and the new UK Halsey sails being installed at 2:30. She has her new Shoe City signs on the hull and some new 'eyes' as well. She is looking pretty fast and ready to get some water under her keel. Up early and home past dark. That's how its been for a while. The media is starting to pick up on my story and I've been doing quite a few interviews recently. We've been going non-stop since the boat got here and I just realized today that Christmas is only a week away! The main thing that I'm looking forward to about Christmas is that soon after I'll be leaving on my sea trial! Its all so exciting! I actually started to pack this morning... I'm the sort of person to throw some cloths in a back pack the night before leaving for anywhere. This time I decided I should take a little more time and care in packing my cloths for this trip. Wild Eyes really is under there somewhere! The guys there are all working so hard. Thanks to them she's all ready for bottom paint tomorrow! It's a bit of a mess at the moment but the decks are all nice and new looking. The second coat of paint was finished today and having new nonskid on there is great! It had worn down so bad before that we all had to be extra careful on deck. You can also see the new solar panels up on the dome, though they're all covered in dust and its not the best shot of them. Wild Eyes is out of the water now. She's in the Windward Boat Yard with tons of people working on absolutely everything! The deck is being sanded down and prepped for a new coat of non skid. Down below Nacho has his workers cutting out the delaminated fiberglass. Allen Blunt, the rigger, examined the rig and said that it looked to be in very good condition and that there isn't much that needs to be done to it. Everyone working on Wild Eyes understands that we have a lot to do in order for me to get out this year, a nd while things are slightly hectic, they are all working hard and are great to have around. Kristy Morrell has been great. She has been putting together a menu of what I will eat for my trip, I will be eating mostly dehydrated foods sponsored by Mountain House. Kristy has talked with Dawn Riley to get a few ideas of things other than dehydrated foods to eat. My departure date hasn't been set yet. There is too much that needs to be done and I will be leaving as soon as we are both ready, not a moment sooner or later. I will announce the departure date as soon as I know when it is. ps. I'll bring a camera with me tomorrow and make sure to get some good pictures of everything! Its been great having Wild Eyes here. 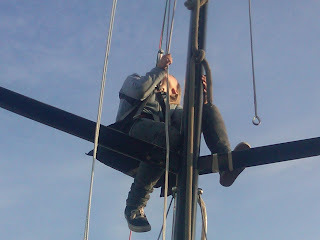 Today we had the rigger come out and the electrician. We'll hopefully be pulling the boat out of the water on Thursday. We're waiting for her custom cradle to be delivered from Mexico. Its been pretty busy around here but I've got a bit of time now so I thought I would address some of your concerns. A lot of the criticism I have received is understandable and somewhat due to a lack of information. First, I will be doing a shakedown trip before I leave. The weather around our local Channel Islands is some of the worst you can get around here. Second, Cape Horn is not for sure. I am keeping open the option of going through Panama as Mike Perham did depending on weather and timing. Also, the non-stop part of my trip is an attempt, and I acknowledge that it is a very difficult thing to achieve. Sailing this type of boat is not at all something new for me. I have sailed around 1,500 miles on Wild Eyes. I know the boat back and forth and, I assure, you the weather was not perfect through all of that. While I was not completely alone on Wild Eyes single-handing is definitely not as new of an experience as many if you seem to think. Before I leave I will have spent plenty of time sailing her alone. I appreciate your concerns. Even if it means waiting another whole year, I will not go until the boat and I are ready. We are going for this year and if all goes well I should be able to get out in time, but if i do have to wait, whats the big deal? I've already got an amazing boat and parents willing to help me, it will just give me more time to prepare. Sorry to leave you all! I had planned to write a quick blog before leaving for Ensenada on Thursday, but while I was up in Whittier with my sponsor, Leedy Ying from Shoe City, I got a call from my dad saying that our friend Peter was going to be sailing to Ensenada in his sail boat, Lady K.
Though a bit inconvenient in timing, I made it home in time to pack my bags and head down to the marina. Peter and I had a nice trip down, spending the night at sea on Wednesday. We motor sailed most of the way and got there late Thursday night. I had hardly slept that night so he dropped me off at the hotel with my dad and Zac who had driven down on Thursday afternoon. It was a pretty nice place but I didn't get a whole lot of sleep there. I had been hoping that Wild Eyes would have already been put in the water so I could spend the night on her, but the ship wasn't even in when we got there. The next morning we got up at 6:00, had some breakfast and headed down to the docks to see if we could see Wild Eys on the ship that had come in late the other night. Pete Thomas, Shashi, and Al Scheib, all from the LA Times waited around down on the docks with us as the estimated time for Wild Eyes' launch got put back farther and farther. Eventually, when they did start to move her, we, the three from the LA Times, Lisa Gizara, the photographer and Eric, her boyfriend, Zac and myself all piled into a panga which carried us over to the ship where we could watch Wild Eyes being put in the water. Once she was lowered off of the ship and in the water, we all piled aboard. We got a few lines and things situated and then gave the engine a try, the first few times it didn't turn over, but we eventually got her going and I moved her over to the dock to wait for my dad who had been enjoying himself for four hours in the customs office. Things were pretty much ready to go once he got there. Zac was going with Peter in his boat and Pete, Shashi, and Al were coming along with my dad and I. We hoped to be in San Diego around midnight - a bit of a trip, but they all (Pete, Shashi, and Al) seemed up for it, so off we went! It was quite a nice little trip with a bit of wind so we were able to sail pretty well for awhile. It eventually died off which was quite disappointing. I watched the speed fall, but there wasn't a whole lot I could do about it. When it took a bit longer than we had hoped... all of our passengers headed down below one by one to get out of the cold wind and try to sleep. I don't know how much success they had - remember Wild Eyes is designed for sing;e-handing! My dad and I spent the night up keeping an eye out for pots and kelp. We got to San Diego about six in the morning. The customs clearance didn't take long to finish up so we fueled up and after our LA Times crew disembarked, headed back out. We were able to sail pretty much the whole way. The one down part was that the auto pilot was down and so I spent another night up hand steerng most of the way. We got into Marina del Rey at about 7:00 am pretty exhausted and ready to go to sleep immediately. Once in her slip I cleaned her up as best I could. She's a bit of a mess at the moment and is in desperate need of a good wash down. I'm good and ready by now to go take a nap, just wanted to update every one real quick first! Abby had such a busy week that she was unable to update her blog before heading south to Ensenada. Good friend and avid sailor, Peter Kokelar, sailed south on his sailboat, Lady K, with Abby to meet Laurence, Zac and the LA Times crew in Ensenada on Thursday evening. Pete offered to come to allow some of the LA Times crew and photographer, Lisa Gizara, opportunity to get those 'at sea' shots. After a good night sleep they were able to receive Wild Eyes and head north on Friday late morning. I spoke to Abby from San Diego this morning briefly while they were waiting to clear customs. It was a long night with little wind and motorsailing close hauled the whole night. She didn't get any sleep but seemed cheerful and upbeat which is good. After clearing customs, the LA Times crew hopped off Wild Eyes to head home. Peter and Zac will continue on board Lady K. Laurence and Abby will continue on Wild Eyes and all should be back sometime early Sunday. Abby will write when she gets back to fill you in on all of the details. Sorry for the troubles with the web site. We are working things out and all content should be up by the end of next week.